SUMMARY: While much of the success one can have in Las Vegas is merely based on luck, crafting effective email marketing campaigns and messaging is a science. We just wrapped up two days of presentations, live optimization and testing, networking and one-on-one clinics at MarketingSherpa Email Summit 2015 in Las Vegas. We heard from marketers at Microsoft, LinkedIn, Finish Line and many other top brands, academics and thought leaders, including Stephen Dubner, co-author of "Freakonomics." Read on for some top takeaways from the event, and be sure to leave a comment about what you're planning for email in 2015. The curtains have closed and marketers have bid adieu to the neon lights of Las Vegas. During the last week of February, practitioners, academics and executives from around the world converged at MarketingSherpa Email Summit 2015. Some had attended previous Summit events, but for others, it was a brand new experience. We heard tactical advice and strategies from marketers in the trenches as well as more high-level methods of thinking about communicating with subscribers and customers. Whether you could not make it to the event this year or did and want a review of the content presented, read on for our top takeaways of Email Summit 2015. Why do some things catch on while others fade into obscurity? We hosted Jonah Berger, Associate Marketing Professor at the Wharton School at the University of Pennsylvania, as a keynote speaker to help shed some light on this question. Author of best-seller Contagious: Why Things Catch On, Berger took the stage and shared his insights to help marketers think about ways to make their messages tastier for consumers. Berger revealed that word-of-mouth messaging generates more than twice the sales of advertising. Attendees were also surprised to hear that only 7% of word-of-mouth marketing happens online. "You can't put a link into a face-to-face conversation. Step outside the technology; think about the psychology," Berger said. So how can you generate viral interest in your particular product or service? What if it's not a very exciting or interesting offering? Practical Value — Ask yourself, is this practical information I'm sharing? To help illustrate social currency, Berger told the audience of a secret bar located in a New York City hot dog shop. Inside, visitors enter a nondescript telephone booth and make reservations in what's known as the "Please Don't Tell" bar. A secret doorway opens for the lucky who manage to get in, and the only way people know about this bar is through word of mouth. There are no signs on streets, yet every day, it's full. This is just one example of trendy speakeasies that have popped up around the country. What makes them so popular? They make themselves a secret, and those who are in on it feel smart, special and included — that's social currency. "The things we say and share affect how people see us. Make your customers look good. If your customers look good, they more likely to share," Berger said. When applied to email marketing, you could provide that social currency by making subscribers feel like insiders so they are more likely to share. Triggers are also key to achieving viral content. When you think of a beach, why does Corona pop to mind? When you hear the word "peanut butter," why do we then also think "jelly"? Finding a trigger can help your customers think of you, even they haven't thought of you in a while. "Find your kernel. If you want more word of mouth, what do you want people to share? What message?" Berger said. We were also joined by Stephen Dubner, co-author of the worldwide best-seller Freakonomics as well as hit podcast host of Freakonomics Radio. His most recent book, Think Like a Freak, was the topic of discussion on the second day of Summit. "What you do and I do is very similar. We are trying to figure out what people want when they say they want something, but end up doing something else," Dubner explained. Dubner asked the Summit audience to raise their hand if they don’t wash their hands after using a public restroom. Of course, 0% of the audience admitted to this, but as Dubner said, it's all about data accuracy. He explained that his research shows about 30% of men do not wash their hands after using the restroom. So what does this have to do with digital marketing? "The circumstances under which data is gathered is related on how reliable that data is. We know we want the data to reflect the real world, so it's easy to persuade yourself and find the data evidence to persuade you that your hypothesis is a good one," he said. This is where declared and revealed preferences come into play: what we say is not what we do in most cases. "We don’t want to acknowledge it as humans. It's not about being deceitful, we think we're going to behave one way and we don’t … incentives drive human behavior whether we like it or not," he said. A lot of other people are trying to do it. Of course, many people said yes to the first two, a few yeses on the third and none for the fourth. The fourth option represents a herd mentality and how we like to think we are making smart decisions for ourselves rather than following the crowd. Then, the researchers set up a field experiment, where they went door to door and hung placards on each doorknob encouraging residents to save energy by using fans. There were five versions of the placard: one with a generic energy conservation headline and four that matched up to the four incentives used in the phone survey. The team then monitored energy usage for each version, and the one that caused the most fan use was the herd mentality sign, even though no one admitted it would persuade them on the phone survey. Why is this happening? In a complicated world, staying in line with a group is much easier than going alone. If everyone around you is doing something, like conserving energy, you probably will, too. As stated in Think Like A Freak, "If you are the person designing an incentive scheme, you can use this knowledge to herd people into doing the right thing — even if they're doing it for the wrong reasons." "You might wish that humans would do the right thing, but that's what the data says … if you are creating incentives, to solve problems you need to find data to understand how people will really act and respond to your messaging," Dubner said. The Kentucky Derby faced a challenge that many email marketers can relate to: They wanted to use email to increase engagement. This increase in engagement was looked at as a stepping stone to increase ticket sales as well as provide more value to sponsors of the event. With that goal in mind, Jeff Koleba, Vice President of Marketing and Programming, and Kate Ellis, Marketing Analyst, both of The Kentucky Derby, set out utilize behavioral information from subscribers to better connect with their audience. 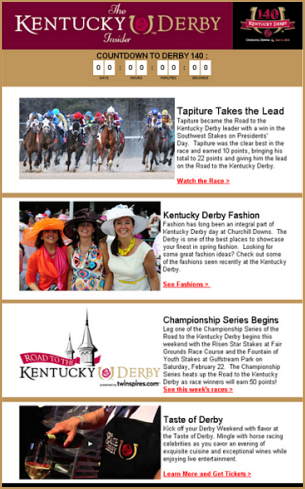 Taking the Kentucky Derby Insider campaign, a weekly newsletter run from February to the main event in May, the team analyzed behavior in the newsletters three content sections (social, equine and gaming) and sought to apply those insights throughout the campaign. By analyzing click data, such as subscribers clicking on calls-to-action related to fashion at the Derby, the team can ascertain what content is most appealing to certain subscribers, rather than pumping out content that gets ignored again and again. 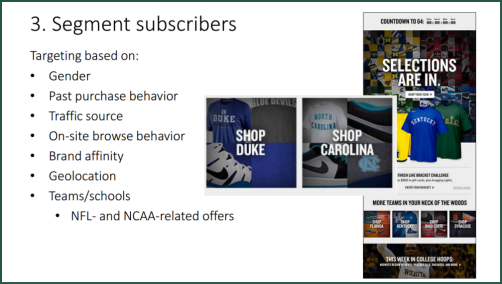 As email marketers, you can use this channel to learn what about your brand interests your customers the most and, of course, what content will drive purchases, Ellis explained. "The more you can learn about what your customer responds to, then you can adapt to increase their interest. Earn the right to sell to your customers by first developing a relationship and knowing who they are — customers who are engaged are more likely to convert," Ellis said. Retaining an existing customer is far easier than generating a new one. This statement is true for every industry, and it's something Diana Primeau, Director of Member Services, CNET, lives by. In her Summit presentation, Primeau walked the audience through CNET's welcome and nurturing campaign to onboard new users as well as how she retains them and keeps engagement high with relevant, segmented content sends. "I work in a world where it doesn’t matter how many subscribers we have. It's about more engagement," Primeau said. Once a new CNET user is welcomed and onboarded to the wide array of services the brand provides, users are then sent content sends relevant to their interactions with CNET and the newsletters that they can opt-in to. Primeau took it a step further and developed a test that pitted segmented email content against unsegmented, and she discovered just how valuable relevant content sends are. In one test, Primeau took a tech news content send and added segmented content relevant to subscribers interested in, not just tech news, but also smart home and appliances content. This segmentation was based on user profile preferences, sit behavior, email click data as well as remarketing data. The segmented content achieved a 307% increase in click rate, proving the value of sending targeted content to subscribers. "It's truly amazing. You've got this new customer; they want to know who you are, they want to engage on your site. It's a huge value for the new users that are very, very interested," Primeau said. You have a lofty goal of achieving buy-in for a complex integrated system, but it could be months until implementation. What can you do in the meantime? Shawna Dahlin, Senior Email Marketing Manager, Microsoft Store, took the stage to present how her team took the data they could already ascertain about customers and worked on a short-term fix that would still boost email revenue and engagement. Dahlin and the team began by looking at what she knew about her customers via frontline interactions with customer service reps, post-purchase surveys, in-store associates and meeting with cross-company product groups. From there, she could segment her audience based on data from transactions, purchase channel as well as geographic information on a customer. With these insights, she could better understand the customer journey and see key touch points and develop customer lifecycles. By evaluating content she already had, segmenting with current capabilities and personalizing the customer journey, her team boosted email revenue 1,200% over three years. "Although still manual, we are talking to our customers in a more meaningful way and are making progress away from the 'spray and pray' that we were doing just a year before," Dahlin said. As far as the long-term solution goes, Dahlin will be taking what her and her team learned and applying that knowledge to further meet customer needs. 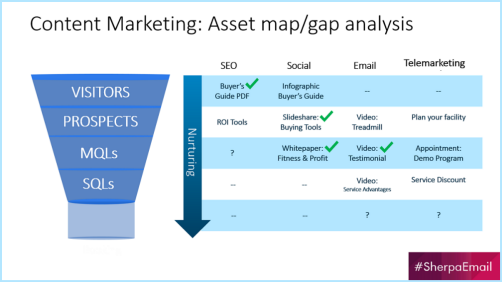 Nurturing prospects through multiple channels of content and targeting them with relevant messaging based on where they are in a sales cycle is key for a complex sale. However, what happens when your CRM system is not integrated into the lead nurturing cycle? Precor's marketing team met this challenge head on and proceeded to lift new leads 74% through a segmented database overhaul. Stephen Bruner, Marketing Manager, Vertical Markets, Precor, took the Summit stage to share his insights on what the team has learned from this effort. Precor, a top fitness equipment manufacturer, refined its CRM system to include personas and built a matrix alongside the sales funnel for asset planning and content marketing based on where the persona is in the cycle. This strategy allows Precor to discover if prospects are potential customers as well as where they are in terms of their readiness to learn more about Precor's products. From this, the marketing team was able to plan and execute email automation. Emails were the vehicle for targeted content marketing, based on what leads are engaging with on the Precor website. As leads become hotter, the team can dial in what specific product piece the prospect has shown interest in as they journey deeper through the sales funnel. At the top of the funnel, Precor utilizes content such as buyer's guides and infographics, which are produced in-house at the company. Blog posts and video content are also leveraged at this stage. As potential prospects are defined as leads, Precor serves up buying tools, then more content to help the lead compete against competitors via whitepaper content. Finally, as leads become Sales-qualified, the automation shuts off, and the team marketers more on the service level. Even post-purchase, Precor strives to keep that relationship strong with more valuable content to help their clients improve their business. Ferguson took the stage as the B2B Best in Show, with Mary Abrahamson, Email Marketing Specialist, Ferguson Enterprises, sharing how her company revamped its approach to email as well as trade show events to better engage customers and prospects. Before this campaign, Ferguson's marketing team identified a challenge with the way they were communicating to their core audience. These were plumbers, HVAC, facilities management and electricians. Was Ferguson serving up the right content for their specific industry areas? Ferguson began segmenting by sending out an email asking subscribers to self-select what industry they were in. This was what Abrahamson explained as the "one-click wonder." This allowed subscribers to self-identify their industry so Ferguson could segment them with relevant content. "This was a low barrier to entry. A lot of companies take this approach for feedback and surveys, and now you know why it's called the 'one click wonder,'" Abrahamson said. From there, Abrahamson was able to deliver rich, relevant content offers to the right recipients. They would be receiving brand-specific promotional product offerings as well as location-based product specification content, plus much more. Also, in an effort to upgrade the event experience, the team took to a mobile focus, eliminating all paper sign-in forms and opting to provide tablets to capture attendee information. As a result of building a richer customer experience, Ferguson has achieved more than $21 million in sales. The team ran 92 automated email campaigns in 12 months, and more than half of all event attendees attributed to hearing about the event via email marketing. Abrahamson found a way to better reach and speak to customers as well as engage with them offline to provide a rich customer experience. "Illuminate the bigger picture. A lot of customers don’t want to part ways from their information. Give them a reason to and provide relevant emails," Abrahamson said. B2C Best in Show winner Finish Line had implemented basic segmentation to personalize email marketing messaging, but the team needed a way to increase relevancy with more segments as well as more channels to reach customers. The result? Aaron Buchanan, Digital Personalization Manager, Finish Line, and the Finish Line team brought on a new automation platform to simultaneously run 300 segments when ramping up to the holiday season. These targeted sends included trigger-based communications, cart abandonment emails, messaging to loyalty program subscribers and much more. Buchanan took it a step further and aligned the marketing with the customer journey across multiple channels. The team unified email, on-site and mobile messaging, social media and display ad messaging. The team built out audience segments based on what they know about customers, including on-site browse behaviors, past purchase behavior, what they are searching for and what the traffic source was. This helped to identify those customers that would be more interested in a particular product offering. From there, they will see targeted display ads across the Web, a more personalized experience on the website as well as special offers via mobile. From implementing more targeted email communications as well as meeting the customer at every touchpoint, Finish Line has seen a 50% increase in email revenue for trigger-based programs. "Honor the conversation the customer is having with your brand via their actions across all of your channels," Buchanan said. It's easy to get swept up in what "omnichannel" means. However, we can all agree, that at its root, it means encompassing all channels to reach customers wherever they are with relevant messages. When thinking about all of your channels, it's key to keep email an integral part of that strategy, as Jacquelyn Kearns, Senior Vice President, Global Digital, and Jeannine D'Allegro, Vice President, Global Leader of Digital Properties, both of Dun & Bradstreet, explained. Kearns and D'Allegro showed how email can directly connect a specific audience to a specific message. The team created an omnichannel strategy using various channels to share specific content aligned with the buyer journey. "We need to create highly engaging content, which we consider our value proposition. Our data that we share is our value proposition," Kearns said. With 7 million contacts the team communicates with every day, complexity can cause confusion, so Kearns and D'Allegro need to connect to the customer experience with content. The team used a qualitative tool to see a heat map of the current website. This revealed to them what customers were clicking on and viewing. This helped Dun & Bradstreet identify ways to better display content for users who were seeking it out on the site. Once the user interface of the site's content display was upgraded and content was added, the team began to segment their audience and deliver emails to specific sets linking them to personalized content. The team also implemented a "Learning Center" on the site to better display content for visitors seeking it out. 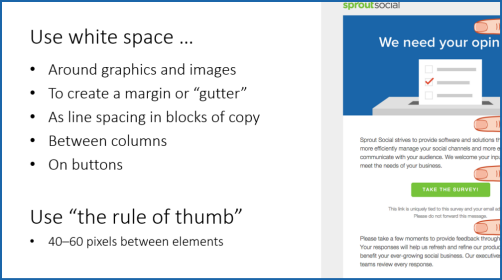 From there, email was used to reinforce this strategy and connect the audience with the content that was most relevant to them. Email was identified as the initiator of the experience on Dun & Bradstreet, and the team used a content email campaign to bring people back. Within 72 hours of sending out the content emails, Kearns and D'Allegro saw a 400% increase in the pages that a visitor viewed and increased the number of pages viewed up to four, which meant for a B2B site with lots of information, the visitors were going deeper into the site and digesting much more information. In meeting customer needs by delivering relevant content, the team saw a 210% increase in form submissions and live chats engagement increased 114%. The team kept this momentum going and continued to develop content distribution channels, such as apps, to make it even easier to consume content. The site was also redesigned further with more persona-based design, delivering relevant content that's easy for specific segments to locate. Moving forward, the team will expand on persona creation to roadmap the customer journey to meet them at every touchpoint, leveraging email as the cornerstone to send prospects to the various channels in which Dun & Bradstreet can provide relevant content and information. "Email will bring you directly to your customers, and you can go from interest to lead to sale through email. Don’t make it tactical; make it a strategic," D'Allegro said. Designing an email can be intimidating, especially if you don't feel like you're a pro at creating visually pleasing messages. But as Justine Jordan, Marketing Director, Litmus explained, design is not art — design is communication. Jordan walked the Summit audience through a few simple tactics that will improve an email's look and feel with basic design principles. First, white space is your friend. Having a blank space or area in an email design is breathing room and can help set the tone, improve legibility and can help to make some of the important elements in your email stand out. Secondly, hierarchy is key. You can use hierarchy in email design to influence user behavior and guide subscribers to click. "Go back to the goal of your communication. What is the purpose of this message?" Jordan explained. If you do have multiple sections in an email, make sure that their headings clearly separate them in a consistent manner. "If all your headings are 24 point font except one, it’s confusing. Use consistent colors, fonts, language and element styles unless you are specifically trying to emphasize a difference," Jordan said. Have you seen a spike in block email bounces? Is your open rate very low or declining? Is your inbox placement rate poor? If so, it may be time to perform a list cleanse. Jeffery Anderson, Digital Marketing Manager, A Place For Mom, shared how through an ongoing focus on list hygiene and smart list pruning, he has been able to steadily increase engagement since the brand's inception. To start, Anderson explained that when it is time to trim a list, defining an "inactive subscriber" is key. Will it be four months of no engagement, or six months? Generate a report with engagement events in the period decided upon and create a new list of only the engaged subscribers. You know have two lists: engaged and non-engaged. From here, you can send a re-engagement email to subscribers on the inactive list and remove the inactive subscribers that fail to respond. But as Anderson explained, archive those inactive subscribers for a later date to re-engage them when your deliverability has improved. "List cleaning is all about deliverability. Inactive subscribers are not just valueless. They are a liability," Anderson said. Before Email Summit kicked off, MECLABS Institute Managing Director and CEO Flint McGlaughlin hosted an email messaging workshop. Attendees of this course learned that conveying a value proposition in all marketing collateral, especially email, is key for conversion optimization. According to McGlaughlin, a value proposition is the answer to this question: If I am your ideal customer, why should I buy from you rather than your competitors? 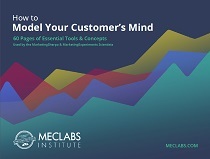 As McGlaughlin explained, our job as marketers is to find the mental levers in a customer's mind that will incite a decision and understand how to pull those levers to get a customer or prospect to say "yes" to your offer. "Motion is incited by the mental lever. There is a lever in the mind and when pulled, it produces an action, and it's our job as marketers to find those levers," McGlaughlin said. Marketers can do this through building trust with customers and humanizing email marketing. "People don’t buy from companies. People buy from people … the essence of building a customer is building trust," he said. The goal for all marketers is to become the customer expert: wisdom is the true essence of sustainable competitive advantage. This wisdom comes from sequential testing of messaging that a customer comes in contact with via email marketing as well as other digital and offline channels. By measuring what works and resonates with the majority of your customers, you can understand what you do not know about your customers' behaviors. Because value proposition communication is so essential to effective email marketing, we invited Jose Palomino, Founder and CEO, Value Prop Interactive, to come and speak to the Summit audience. How can I safely step into your offering? How will your offering affect me financially? How does your offering compare to my alternatives? As Palomino explained, each of these five doubts are like a red light that cause a potential customer to pause and think more deeply about your offer to them. All marketers will have some form of competitor and alternatives in the marketplace that they need to address and differentiate themselves from. It is also key to honor customer expectations about your brand. Palomino gave the example that you would not see McDonald's selling a $50 burger, or a Morton's Steakhouse offering up a dollar menu. "People have expectations. Are your representing yourself as the right kind of organization to meet your customers' needs?" he said. In the B2B space, with long and complex sales cycles, Palomino urged marketers to think beyond providing heavy white papers and invest more in follow-up opportunities. "Consumers won't work hard to figure your offer out. They will move on. Help consumers process these thoughts," he added. A key theme present throughout presentations, roundtables and networking conversations at MarketingSherpa Email Summit 2015 revolved around the customer experience. With a vast array of advanced technologies to take email marketing to the next level for many organizations, it's still essential to think about the customer. Create an experience that honors what your customer is seeking and expecting from your brand. Serve up content and offers relevant to their interests via email and connect email marketing with your other channels, such as social, mobile apps and on-site. And of course, be focused on what you want to achieve with email marketing — the metrics you measure should reflect that. Test and optimize every element in your email marketing to ensure you are sending the most effective message possible, and continue iterations on a test to further optimize. "A testing process leads to pattern recognition which leads to customer wisdom … Inspire action after the email, and start a genuine relationship. Learn how to get people to continue up the sales funnel," McGlaughlin said. Marketing Research Chart: How do marketers perceive the ROI of email marketing?